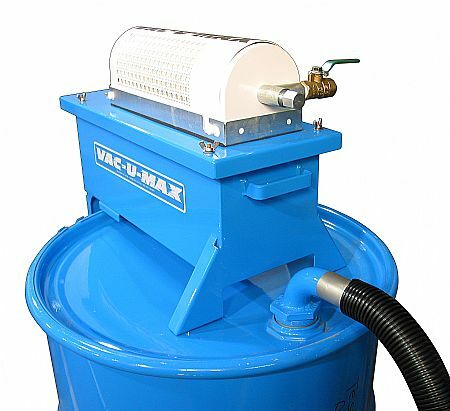 The VAC-U-MAX TK unit mounts directly to the top of a 30 gallon or 55 gallon closed top drum. It is ideal for cleaning up liquid spills and recovering the liquid into the drum. The VAC-U-MAX Model TK-01 is a unique industrial vacuum cleaner designed for high-speed transfer of various liquids directly into a closed top 55-gallon drum. The TK-01 operates on plant compressed air and provides high suction that offers recovery rates at better than one-gallon per second. These units are compact and fit directly on the holes of a closed top, vacuum tight, 55-gallon drum. This unit also features the lowest compressed air consumption on the market today, only 35 SCFM @ 60 PSIG! They are designed increase plant efficiency and improve overall productivity. The VAC-U-MAX TK-01 saves time, money and is easy to operate. TK Unit has been designed for use on closed-top 30 or 55 gallon (16 gauge minimum) steel drums. Noise Level: 79 DBA @ 6" Hg.